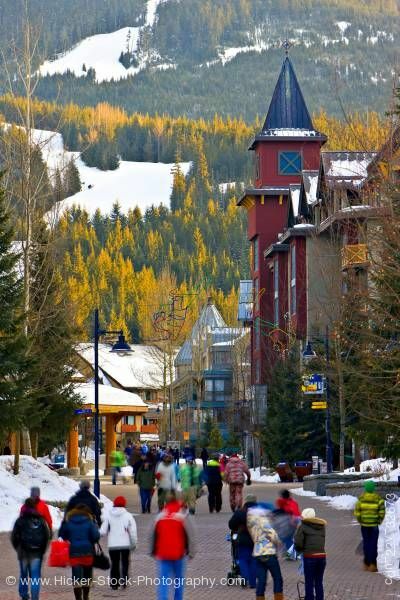 This stock photo shows pedestrians walking along the Village Stroll in Whistler Village with Whistler Mountain in the background, British Columbia, Canada. You don't ever need a car to explore everything Whistler Village has to offer. Everything is close and convenient. Whistler Village is a shopper’s paradise with more than 200 stores that sell everything from unique souvenirs, gifts and t-shirts to designer clothing, art and outdoor gear. Whether you’re craving Italian, Greek, Japanese, French, pub food, pizza or ice cream, the Village has a restaurant to satisfy your cravings. There are a number of pubs, bars and lounges to unwind in during aprés and if you’re looking for a latte, cozy coffee houses are scattered throughout the Village. Before the skiers and boarders came, Whistler was a logging town with the name Alta Lake. The first ski resort opened in what is now the Creekside area in 1967 and a second resort opened on Blackcomb mountain in 1980. The two merged in 1988 and full-scale development of Whistler Village began shortly after. Whistler will get its Olympic wishes in 2010, as it will host most of the ski and sliding events for the 2010 Winter Olympics.